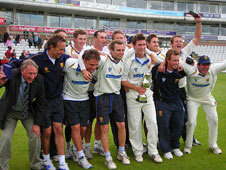 Shropshire beat Lincolnshire by seven wickets in the Minor Counties Knock-out Trophy final at Chester-le-Street. Batting first, Lincs made 249-6 from their 50 overs with Liam Andrews making 52 not out and captain Paul Cook 50. Shropshire made a rapid start, reaching 55-0 from seven overs before being slowed by Lincolnshire's bowlers. But an unbroken stand of 107 between captain Ed Foster (95no) and Joe Leach (67no) for the fourth wicket saw them home with 31 balls to spare. Shropshire win by seven wickets.